So, how IS the internet? Well, I’m glad you asked. Look up, way up. (I hope you will catch the Friendly Giant reference.) Can you see that small diamond-shaped piece of metal attached to the ancient TV antenna that towers over the Manse? That, people, is the magic gizmo that catches the Xplornet internet signal and brings it into our home. It has changed our lives immeasurably for the better. I don’t suppose it’s been keeping any of you awake at night or anything, but I’ve had enough people ask me whether our new internet setup here at the Manse is working out well that I decided I should give those interested a full and complete report. After all, longtime readers of Meanwhile, at the Manse will be well aware of my many, many posts of frustration and sometimes even despair about the poor (and costly) internet options that until recently were all that was available to us in Queensborough. It has been a month and a bit since Raymond and I acquired a hookup through Xplornet, the company contracted by the Eastern Ontario Regional Network, a kind of municipal co-op with the mission of providing high-speed internet service to Eastern Ontario. That hookup was made possible by Xplornet making the excellent decision to erect a communications tower on Declair Road, just a little north and east of Queensborough. 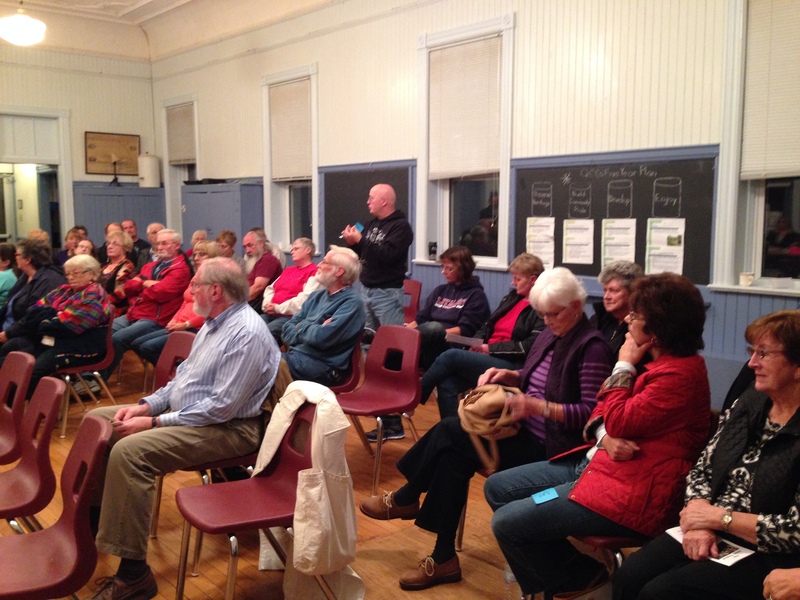 When those of us who live here in our pretty little river-valley village heard the news of plans for the tower, we were all atwitter: would this finally mean decent internet service? When the tower went into service early this year, we started signing up. Raymond and I were near the front of the line. And now, after about six weeks of the new setup, all I have to say about it is this: our lives have utterly changed. For the better. 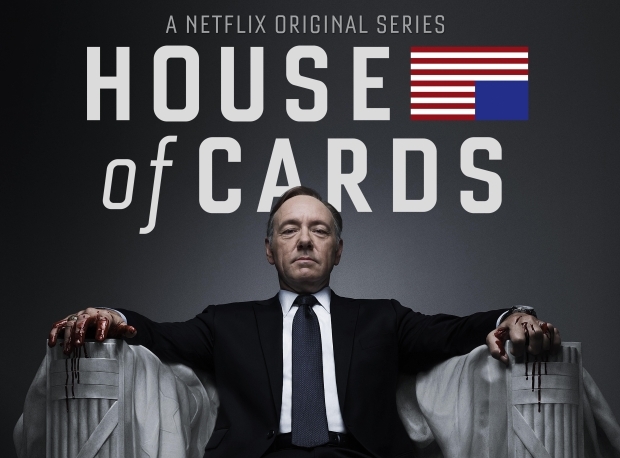 A brilliant online-only show that we can now watch at the Manse! People, we have endless internet! All we can use, and to spare! We can use Netflix! 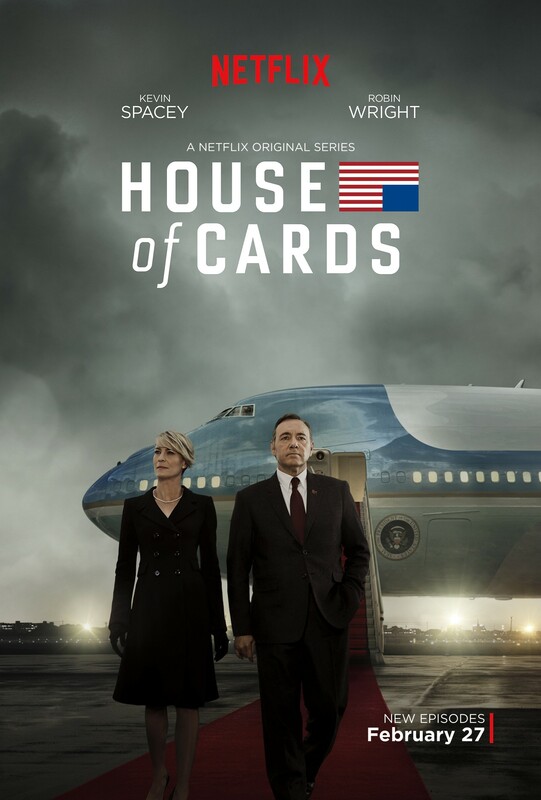 We can watch House of Cards! We can watch anything! Online! In high definition! On our laptops and phones, we can watch YouTube videos and download audiobooks and even listen to streamed radio broadcasts. And on television (or his laptop, or his phone) Raymond can watch every blessed one of the games that his beloved Red Sox play. In HD. And it is all costing us less than we were paying previously for the barest of bare-bones internet! As you can probably tell, I am absolutely thrilled about this. And I am not just thrilled for Raymond and me at the Manse – because, contrary to what it might sometimes sound like here, it is not all about us. No, what I am really thrilled about is the possibilities that this service offers to our own rural area and to others like it in Eastern Ontario. Suddenly it is possible for a business that needs good internet service (and what business in 2015 doesn’t need good internet service?) to operate here. It means that smart, creative people who are tired of city life and want to come live and work in God’s country (translation: North of 7) can do so, and by doing so can and will contribute to our local tax base and economy and community life. So please allow me, the person who complained so loudly and so long, so unequivocally and so publicly, when the the internet was bad, to hereby offer up my huge thanks to the good folks at the Eastern Ontario Regional Network (with a special shoutout to Hastings County chief administrative officer and co-leader of the EORN team Jim Pine, who was kind enough to reply helpfully to my emails of inquiry and concern about the situation when I first realized how bad it was), and to those at Xplornet (who put up that blessed tower on Declair Road). Thank you, thank you, thank you! You have made our community a better place, one with more to offer and with a much greater potential to thrive. People, this is a good-news story, pure and simple. The internet has come to Queensborough. It is good internet. It is reasonably priced internet. Just when you thought that life in Queensborough couldn’t get any better – it did. Ryan from Elite Electronics of Tweed setting up our internet this afternoon. Yay! “My love, I can’t believe it,” Raymond exclaimed to me just now. “Xplornet has come to Queensborough!” Raymond has been bustling around the house for the past few minutes, setting up all our communications devices to talk to our Apple AirPort wi-fi box – which in turn is talking to the wondrous, magic little Xplornet box that is bringing real, honest-to-God internet to the Manse! 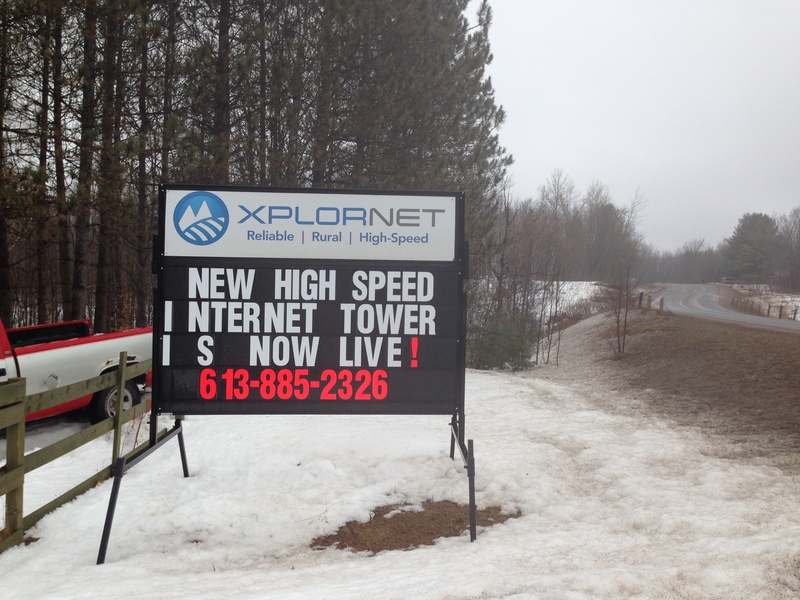 That real, honest-to-God internet is being beamed our way from a tower that Xplornet – the company charged with providing high-speed internet to Eastern Ontario – recently erected a bit northeast of Queensborough. The tower went live not long ago, and throughout our little village people are signing up for service, after years of the frustration and expense of second-rate solutions. Today it was our turn. Ryan, a very nice young man from Xplornet outlet Elite Electronics in Tweed, arrived as scheduled this afternoon. 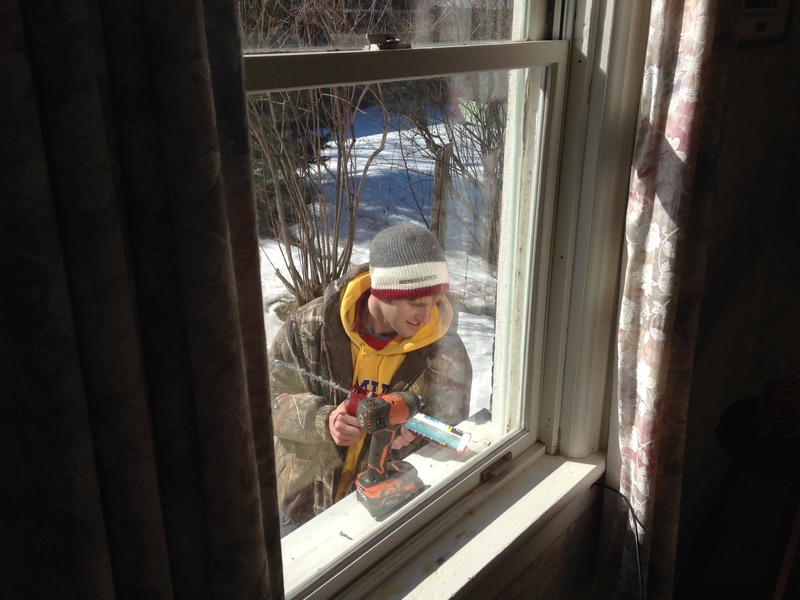 He attached some sort of receiver thingy to the exterior of the Manse, strung a cable into the house, and set up the magic box that brings us internet. 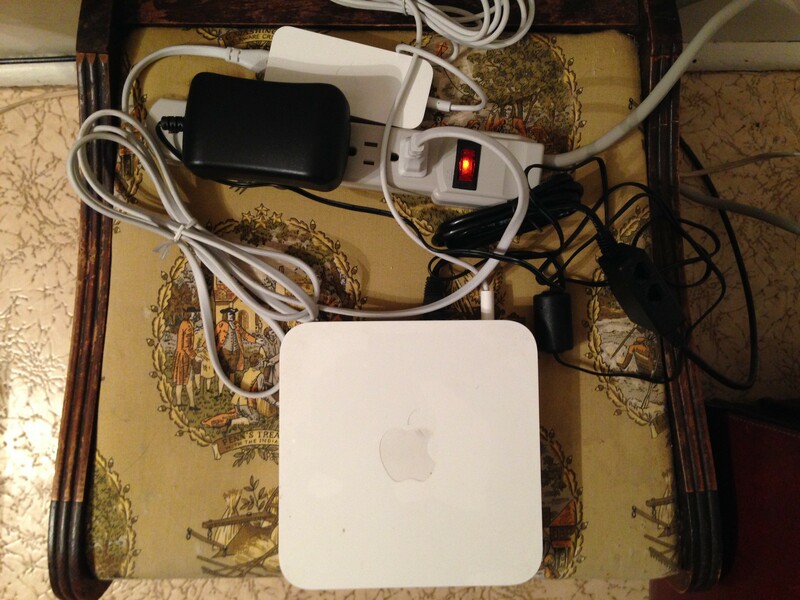 When we attach that magic box to the AirPort, we suddenly have internet all over the house. 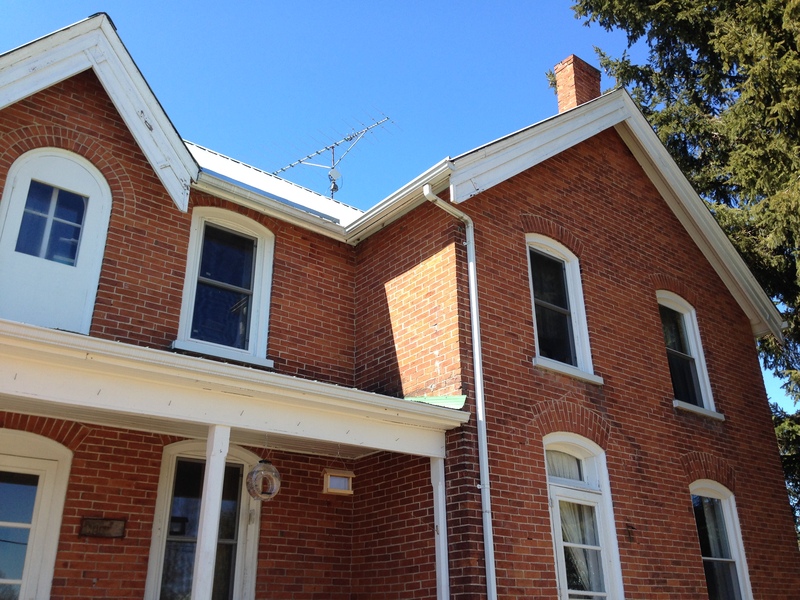 The internet control centre: the magic Xplornet box (small black thingamabob at right) connected to the AirPort (larger white thingamabob at centre), all of which bring us internet all over this old Manse. A vintage footstool found at a Maine antique market seems just right thing for the setup. And it’s fast internet! And we have lots of it! It’s all so exciting! No wonder Raymond was exclaiming as he set up the devices. It’s wondrous! It’s magic! It makes we want to sing! And so here’s a song that came into my head when I wrote that bit about the Magic Box. From 1968 – the era when I was a kid growing up in this Manse. Who would have thought way back then that internet magic would not only exist, but be right here in little Queensborough? The sign we have been waiting for. When you’re Raymond and me, people, this is the sign you want to see. It appeared recently on Queensborough Road (which you can see in the background of my photo) just a little north of Highway 7. Its message: that a newly erected communications tower – that would be the one on which I was pinning my hopes for decent internet at a reasonable price; I wrote about it here when word of the tower’s coming first landed – is operational. Which means that, in theory at least, the people of Queensborough, many of whom have been struggling with poor internet and/or exorbitant prices for it, will be able to enjoy the luxury of a service that city folk take for granted. How we investigated the possibility of satellite-delivered internet, though worried about snow and rain disrupting our signal; and in the end decided no way when the internet guy told us the only way we could get a decent signal was if we put the satellite dish atop a pole we’d have to erect in concrete at our property’s edge. How we were less thrilled when we learned that our regular monthly bill for this pay-per-usage service would be about $100. And we weren’t even using it heavily! How that wasn’t the last such monster bill. And how we continue to be frustrated and annoyed that we can’t take advantage of great inventions like Netflix, because watching a movie or TV show via internet would send our bill completely through the roof once again. But all of that expense and frustration may finally be at an end! Some people in Queensborough have already had the new service installed, and, though it’s very early days, seem to be quite satisfied. Others have set up appointments for the internet guys to come around, and are anxiously waiting for that to happen. Among the households in that situation is us, here at the Manse. We’re hoping to get a package that should give us all the high-speed internet we could reasonably use – Netflix included! – for $70 a month. I have to tell you that after many, many months of frustration at signals that cut out, constant worry that we’re using too much data just by watching something like a YouTube video, and more than a few bills in the $200 to $300 range, we are very, very excited. Will it work? Can this actually happen? We’ll find out Thursday. Which cannot come too soon. 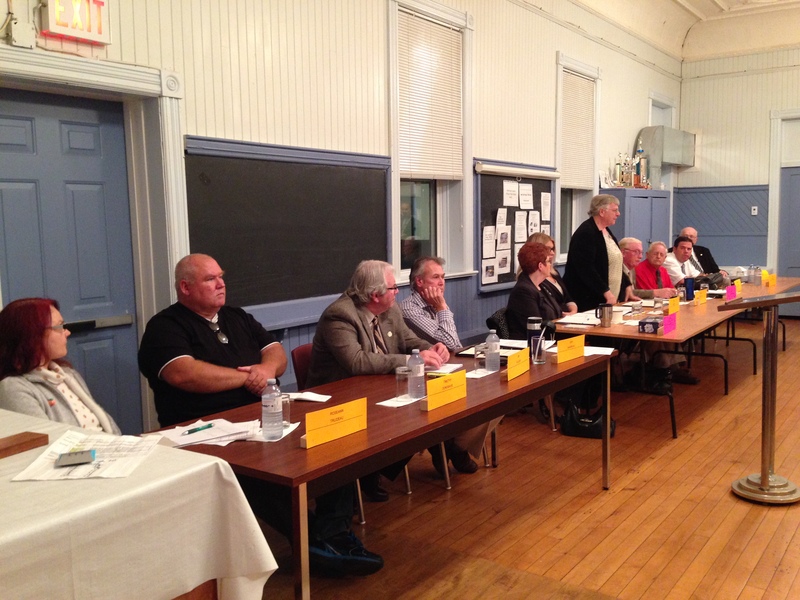 Could there finally be hope for the internet in Queensborough? This notice in one of the local weekly papers, hot off the presses today, contains what I believe is the best news I’ve heard for a while. It brings internet hope to the Manse! Oh, big news today, people. Big news! What news, you ask? This: that there might be a glimmer of hope that Queensborough will get out of internet purgatory – or is it hell? – and be able to enjoy the same access to the proverbial information superhighway that most of the rest of the world (and I include in this remotest Africa) already has. I cannot begin to tell you how excited I am about this. WOW! Good news (I hope). 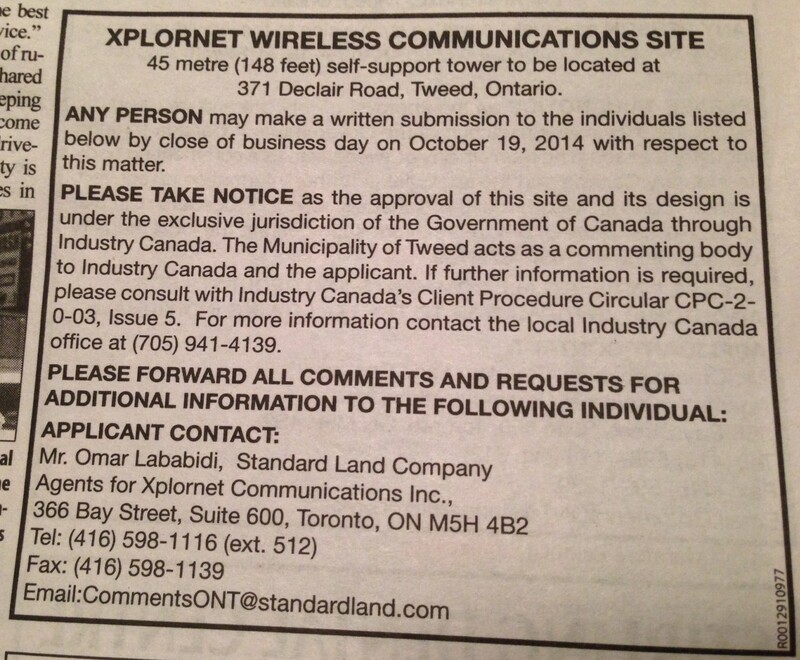 Xplornet wants to put a tower up at 371 Declair Rd. Well! You would probably have had to be here at the Manse one night about this time a month ago to understand how thrilled I was to hear this. That was the night when tears of rage and frustration were running down my cheeks because the slow-to-impossible internet, for which we are paying an arm and a leg, meant that it took close to four hours for me to put up a straightforward post here at Meanwhile, at the Manse about the gardens that would be on display during Historic Queensborough Day. I started in the early evening and, because it took hours to upload the photos (which would have zipped through in less than a minute in any normal internet situation), finished after midnight, long past my work-week bedtime. I was exhausted, frustrated, and mad as hades. So what’s so exciting about a plan to put up an Xplornet tower on Declair Road? Well, I’ll tell you. Declair Road is located (despite the rather misleading “Tweed” address in the notice that Raymond had seen in one of the local papers, which you can see in the photo atop this post; Queensborough is in fact part of what I like to call the GTA, the Greater Tweed Area) just a couple of miles northeast of Queensborough. If a tower for Xplornet – an internet provider set up by local governments in Eastern Ontario (though it has now expanded to other parts of Canada) to bring service to rural areas – goes up there, it seems a reasonable assumption that its signals might actually beam down into Queensborough! I even venture to hope that this tower is being proposed precisely because the Xplornet people are aware – I know this thanks to a very helpful engineer with the operation telling me so last fall – that Queensborough is what they call “an underserved area” when it comes to the internet. Ah, but that Declair Road tower might bring some internet. And some fairness. And that, people, would make me a happy, happy woman.